When Paul Goodall walks his farm, he has a lot to remember. As he crosses the hilly pastures, Paul remembers to check his water troughs for overflow, inspect his cattle fence, and monitor the growth of a stand of newly planted trees. On a 600 acre farm, something always needs attention. But wherever he goes, he can’t help also remembering his father. 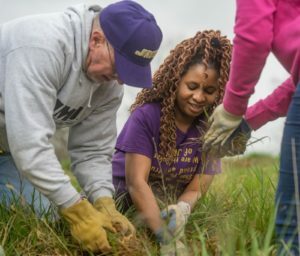 Paul Goodall plants a tree sapling with a JMU student volunteer. Photo by Elise Tressel. Paul gestures to a pond surrounded by a field of new trees, each enclosed in a protective green plastic tube. Paul described the bird activity as “tremendous” and was delighted to see evidence of otter, deer, and fox along the thickly vegetated bank. “None of this would have been possible in its previous condition,” he said. As recently as last year, this pond along Beahm Town Road in Madison County was a muddy, barren pit, picked clean of vegetation and inhabited only by the cattle that drank, bathed, and defecated in its shallow water. A new barbwire fence now encloses the pond and the surrounding wetland. Under its protection, the 5-acre pondscape has transformed into a lush garden, pin-cushioned with chest-high saplings planted this year by Friends of the Rappahannock volunteers and partners. Paul follows a trail of hoofprints to a square concrete water trough where the cattle, barred from drinking from the bacteria-laden pond, sip clean and cool water diverted from a nearby well. Paul, a professor of Integrated Science and Technology at JMU, installed the water system and cattle fence last year using an agricultural cost-share provided by Culpeper Soil and Water Conservation District. Finally, Paul walks down a hill toward the Robinson River, passing through another grove of new tree tubes to a shaded beach. “My brother Joe and I were actually baptized in the river here,” Paul says, pointing to a sandy spot just steps away from a sycamore sapling starting to peek out of its green tube. Paul’s grandfather, Joseph Goodall, originally purchased the property around 1900 and later passed it to his son Culton, who began raising his young family there. The brothers grew up swimming and fishing the Robinson, which was frequently the site of family picnics and gatherings. Wetsel Middle School Teacher Devin Milbourne plants trees with his students at the Goodall farm. Photo by Elise Tressel. In spring 2018, Friends of the Rappahannock (FOR) assisted the Goodalls by planting over 3,700 new native trees and shrubs on the property, helping establish 16 acres of new forest and covering nearly a mile of river, pond, and stream frontage with new riparian forest buffers. “This is the single largest planting project in FOR’s 33-year history,” said Bryan Hofmann, FOR programs manager. As they mature, the new riparian forest buffers will filter runoff, absorb pollutants, reduce erosion, and help shade and nourish the water, providing numerous benefits to the water quality and habitat of the Rappahannock River system. 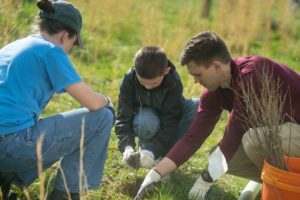 Approximately 1,200 of the trees were planted by volunteers, including 108 students bussed from five schools throughout the Rappahannock watershed. In between planting shifts, the students took turns touring the property with Paul and sampling river water with an FOR educator. Paul and Joe made sure to join the students on all three planting days. “Getting to share this with young people was just the icing on the cake for us,” Paul said. This project is part of the Headwaters Stream Initiative, which is a partnership between Friends of the Rappahannock and Piedmont Environmental Council, in conjunction with the Virginia Department of Forestry and local Soil and Water Conservation Districts. This program is made possible by grants from the National Fish and Wildlife Foundation, Virginia Department of Forestry, the Chesapeake Bay Trust, and contributions from numerous other partners.